We love gemstones for their delightful sweetshop-colours; they bring sunshine and sparkle to our world. But for jewellers we must also understand some basic gemmology if our objective is to make high end, lasting jewellery. Qualities like hardness, chemical constituency and light sensitivity all affect our choice of gemstone when designing jewellery. For example, cinnabar often appears as a beautiful red to purple translucent crystal gemstone. However it’s mercurial content makes it toxic and thoroughly unsuitable to wear in any form. Pyrite is composed mostly of iron sulphide, it becomes sulphuric acid when it reacts with oxygen. It often also contains nickel, a known allergen so this is not a stone to wear close to your heart, nor to give your loved one! 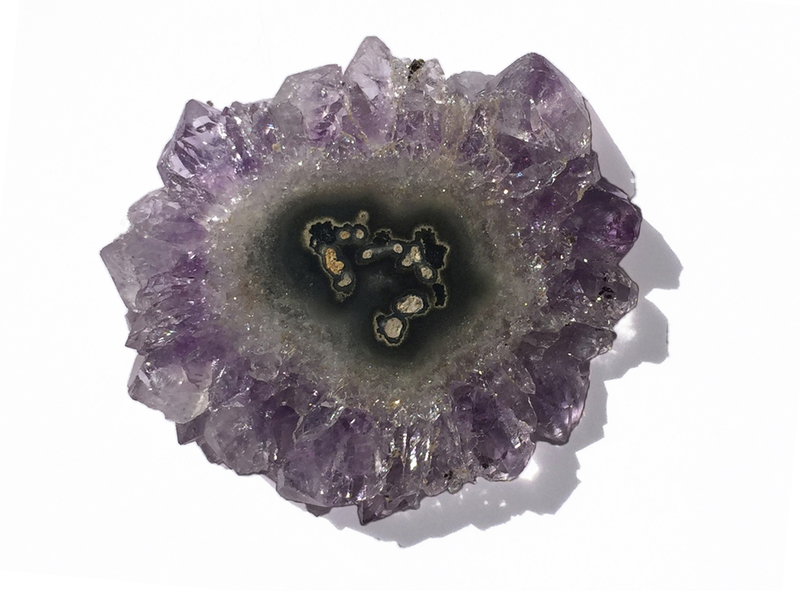 Amethyst on the other hand, being quartz, is quite benign but will lose it’s colour intensity if exposed long-term to light. Your ring may fade; amethyst earrings might fare better in the shadow of hair and neck. In their raw state, gemstones can be readily identified by their crystal structure. For example, quartz is easily recognised by it’s trigonal (like a hexagon but with 3 sides broad, 3 narrower), often double-pointed form. It could never be mistaken for a colourless spinel because the latter grows in cubic crystal form. So taking into account the length of the crystal as well as the number and quality of sides it has, we are able to easily distinguish between these clear crystals. Crystal structure is also very important to the way we handle gemstones. If we understand the way it has grown we can anticipate it’s cleavage – if, where or how it is most likely to split or fracture. This affects the way a stone will be cut and faceted, and also how it should be set. The much adored emerald is a good example: it is a hard stone, but it’s brittleness makes it very prone to chipping. 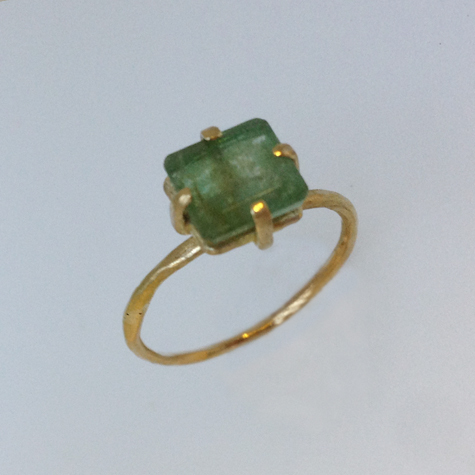 This beryl grows in long hexagonal crystals that make it suitable for long, thin cuts, but to remove the likelihood of chipping, the stone is usually prepared with the well known ‘Emerald Cut’ – a style of rectangular, faceted gemstone cut that is easily recognised by its long, stepped facets, it’s bevelled corners and edges. It’s an appealing cut that can be readily incorporated into lots of jewellery designs, and so the ’emerald cut’ is not limited to emeralds. You can request this style in any type of stone, regardless of how strong or hard it might be. (An emerald-cut diamond, for example). Conversely, when we are designing a piece of jewellery for a specific stone, we need to understand which techniques we need to employ to best show it off, meanwhile provide adequate protection. Diamonds on the other hand, being tough and hard, can really take any form of setting you desire. You can even solder it into your jewellery if you must! But traditional diamond designs seek to show as much of the stone as possible to give full visual value for money, so usually you will find these claw-set too.! Want to know more about gemmology and stone setting? You can also sign up for the full Bonanza 5 Saturdays to complete your foundation knowledge of gemmology (click). Gemmology is a vast and fascinating subject for serious study. Our courses are presented from a jeweller’s perspective. We aim to open the door to this exciting world, and provide useful working knowledge to enable and improve your jewellery design. If you like what you learn, and you want to pursue a career as a gemmologist or a diamond grader we recommend both the Gemmological Association (Gem-A) and the Gemological institute of America (GIA) for well recognised and respected professional courses. Tagged gemology, stone setting, weekend workshops. Bookmark the permalink.